Our mashups directory has been updated. A huge collection of applications: Twitter, Google Maps, LBS, QR-codes, mobile HTML5 etc. Our mashup Links from Twitter has been updated. Lets you see links published in Twitter by the friends of any user. E.g. check out what Twitter’s CEO is reading (or, at least, is seeing) etc. Sometimes it could be a good source of information for you. Read Twitter through someone else's view. Actually you do not need to login/share password etc. for this mashup. You can read links even without your own account in Twitter. And of course, if you are in Twitter you can read your own timeline via this mashup too. Just got a new version of Google Maps for Android. It looks like Google is reading :-) Now you can share your location a way similar to Geo Messages Even bit.ly is used instead of Google’s analogue. Just can not check out their server side part – it returns 502 status. P.S. And Geo Messages work :-). Btw, you will see soon a version for JME phones. Our mashup Where are you now has been updated. It is the most popular question in the mobile messaging. 600 billion per yer - more than impressive digit. For servicing such kind of requests we offer Geo Messages approach. It introduces a new way for sharing location info data in mobile networks. This approach could be used as a base for many mobile services. You can find many of them on Geo Messages page. Let us describe a yet another service. We have a simple application Geo Mail. It lets users send mobile email with location info in the signature. 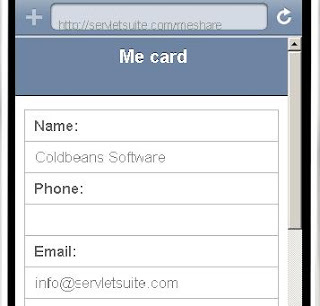 It is mobile web application (HTML5), you do not need to install any code. It is enough to know the service URL only (e.g. keep it in the bookmarks). But what about the following use case? You need to know somebody else location but he/she has not this URL (unaware about that service). A very simple solution – let us send him/her a link to Geo Mail. So as soon as our message is received our target party will be able to respond with location info via email. Of course if he/she decided to do that. So by this way we are also solving privacy issues – it is completely up to target party respond or to not to location info request. It is exactly what our mashup Where are you now is doing. You are welcome to check out a new mashup from our suite – Places from Facebook. (it is a mobile site). It is cloud based implementation. Mashup saves data in Google Fusion tables and uses forums from Disqus. City forums - mashup combines places from Foursquare and cloud forums from Disqus. Could be used in Gov 2.0 projects, for example. An interesting technical article: Introducing the Google Fusion Tables API. Java source code. "The European Union’s top advisory body on online privacy will issue an opinion this month saying that information collected by phone and Internet companies on customer locations must be treated like names, birthdays and other personal data, EU officials say. That means smartphone giants like Apple Inc. and Google Inc. will likely have to obtain user consent before gathering the data, delete the information after a certain period of time and keep it anonymous." - from WSJ. Obviously, it means that LBS applications could be affected. P.S. by the way, it means that Geo Messages approach is getting even more interesting. It lets users share location data on peer to peer basic, there are no servers with location data. http://localphoto.linkstore.ru (it is a mobile site). The best launch is if you have a product that other people like using so much that they tell other people about it. Hot or not, $MSFT vs. $GOOG, euro vs. USD, Chelsea vs. MU etc. - all this in our updated mashup Tweet versus Tweet. In the latest version you can directly pass search terms to URL. Parameters are: t1 and t2. Our mashup Info from Twitter has been updated. It lets you pickup from the social graph other resources, associated with the given twitter account. It is a dead simple way to discover who is your new follower and who you follow to in Twitter. WHOIS for Twitter. Also here you find an appropriate bookmarklet for this service. (it is a mobile site) or through QR-code above. This is a simple HTML5 mobile web application that lets you create blinking phone. The full screen is flashing with the selected color. Try it with your iPhone, Android etc. Flash-mob organizer, voting tool, taxi call at night etc. MECARD is a text format lets you present address information for phonebook registration. You can think of MECARD as a light version of vCard. Essentially, a single line of text contains all the meta data and appropriate information for populating an address book. Info such as name, address, telephone, email, URL and more. QR-code scanner on mobile phone automatically recognizes MECARD and suggests a new entry for address book. So you can avoid manual typing for name, address etc. It is just one click deal for adding new contact. 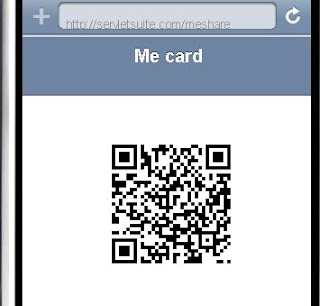 Just ask your partner to scan QR-code with MECARD. It is used in mobile services. See for example widget для Opera. Widgets can save data in the own memory, so you do not need to type them again. It is very important to highlight that we do not need any external server. All your contact info is actually saved in your phone. For the second call you do not need to type your data again. Just open that page in your mobile browser (e.g. from bookmarks) and get QR-code. We continue to publish links for monitoring the interesting events in Twitter. Now it is Social location, SF, 2011. The convergence of the social web, mobile and local-business. P.P.S. very interesting! Btw, it is what our Geo Messages and QRpon services are about. One of the most delicious from our mashups has been updated. Get an idea about your next lunch right from Twitter. Mashup Food from Twitter shows you the live stream of food pictures just published in Twitter. See what other people are eating right now. London on Twitter mashup has been updated. See the latest city news in the real time. An interesting article The Future of Geolocation: What is Coming?. Shortly: recommendations and social connections. A picture is worth a thousand words. Our mashup Twitter's day in photos has been updated. It presents for you trends in Twitter, illustrated by the Twitter's photos.